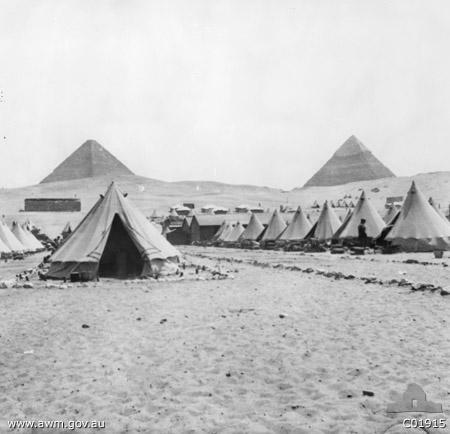 The 1st Battalion had arrived in Egypt on the 9th of December 1915. Together with the rest of the Australian 1st Division, they then spent the next four months in hard training. By April 1915, they were a superbly fit and trained army. 9th December: Entrain for Cairo. Miles of flat country under cultivation & irrigation. Saw many typical biblical scenes. It is said Egypt has not changed since the time of Christ & I quite believe it. See fields of maize, cotton & vegetables, fruit, etc. Arrive Cairo 1pm. All treated to hot cocoa & a hot roll each. Take tram for Pyramids where we encamp. Perhaps we should briefly look at how these young Australians came to be in the shadows of the Pyramids almost 100 years ago. "August 4, 1914. Cable and wireless hurried Britain's declaration of war against Germany to the world. At Victoria Barracks, Sydney, as in all parts of the empire, were enacted the opening scenes of the great drama that was to have the world as its stage and millions of men and women as its actors." The military was charged with forming the 1st Australian Division. The main components of this Division were to be four infantry brigades, each brigade would have four infantry battalions and each battalion would have eight (later changed to four) infantry companies. In turn each company would be comprised of a number of platoons, usually four. In addition to the infantry component, the 1st Division would also have artillery, engineers, field ambulance, signals, transport and other support elements. For the purpose of our story, what we end up with by April 25 1915 is the 1st Brigade, with battalions 1 to 4, 2nd Brigade with battalions 5 to 8, 3rd Brigade (to be the covering force & first ashore at Gallipoli) with battalions 9 to 12 and the 4th Brigade (later assigned to the NZ & Australian Division for the Gallipoli landing) with battalions 13 to 16. Each battalion consisted of approximately 1000 men. What follows is a quote from Chapter 5 of the Official History by CW Bean. While it doesn't talk specifically of the formation of the 1st Battalion, it serves to provide a clear guide as to the events taking place at the time. At each Australian Capital, about the middle of August, the infant regiments began to take shape. In most cases the officer chosen to command one of them received between the 13th and 17th of August a telegram informing him of the fact, and instructing him to organise his unit and choose its officers. The brigadier, who had selected him, generally helped by suggesting a second-in-command, an adjutant (always a regular officer or adjutant of militia), and allotted him four permanent non-commissioned officers-often old British N.C.O. 's-to form the backbone of the regimental staff. The commanding officer then began to pick the rest of his staff, mainly from the militia officers who volunteered in the areas allotted to his unit, and on or about August 17th, all over Australia, the regiments, battalions, and companies of the Australian Imperial Force began to concentrate in some camp near the capital cities of the States. On Randwick Racecourse and the grassy sandhills of Kensington, both in the suburbs of Sydney; at Broadmeadows, a bleak, grassy plateau ten miles from Melbourne; at Morphettville in South Australia; at Enoggera in Queensland, Blackboy Hill in Western Australia and Pontville in Tasmania, for the space of one month the army was growing. The growth of the units may be judged from the instance already given-that of the 3rd Battalion of Infantry. On Monday, August 17th, it marched to Randwick Racecourse 330 strong-20 acting-officers and 310 men. On August 18th three companies were formed; on August 20th they had grown to five. On that day the issue of clothing began. By the 22nd the battalion had I8 acting-officers and 503 men. On the 26th its rifles were issued, and next day five officers and five non-commissioned officers were sent to Randwick Rifle Range for instruction in musketry, so that they could teach the rest. On August 29th recruiting for the battalion in the country districts had commenced, an officer being sent to meet the trains and conduct the country recruits to Kensington Racecourse, where the battalion was now camped in tents. By September 3rd the battalion was complete-32 officers and 991 men. It was allowed to recruit 75 men over its strength, in order that unsuitable men could be discharged. On September 14th it marched out for the first time with its brigade to the heathland overlooking the sea at Maroubra. It had now some of its wagons, 11 horses, and the two Maxim machine-guns which were then allotted to every battalion. On September 16th the brass band held its first daily practice. On September 20th the men’s paybooks were compiled. By September 23rd, when the battalion was five weeks old, musketry practice had begun, the battalion had its horses complete, and the order was issued for the embarkation of the men in the Aberdeen liner Euripides in Sydney Harbour, and for that of the horses and drivers in the Clan Maccorguodale. On September 27th orders were received to defer embarkation. The horses and drivers already on board the Clan Maccorgriodole were taken off the next day. The same history, with variations, would he true of almost every unit in the young force. The units of the 1st contingent all over Australia were complete and ready to sail by September 21st. All leave stopped. Went to Cairo to get money from the bank. Had a tight squeeze to get through on a crook pass. Also had a job to get money owing to not having my identification disc with me. Left camp at 6pm to entrain for destination unknown. Arrived Alexandria 5am (April 4,Ed.). Went aboard “Minnewaska”. Rumoured we are going to Dardenelles. Loading goods all day. J. Cairns & I got out and went up town. Got back about an hour before we left the wharf and anchored in mid stream. On Easter Sunday, April 4, 1915, the 1st Battalion embarked on Transport A.11, the Minnewaska.......There were no tables, hammocks or other conveniences. The men had to live, sleep and eat on the iron decks in the holds. The troops were put on service rations - bully beef and biscuits. One of the men wrote: "Everything seems to be iron about this business. We are on an iron ship. We sleep on an iron deck. We are fed on iron rations, and now we are told that our Commander is Sir Ian Hamilton." But the fact that something was doing more than atoned for these discomforts. 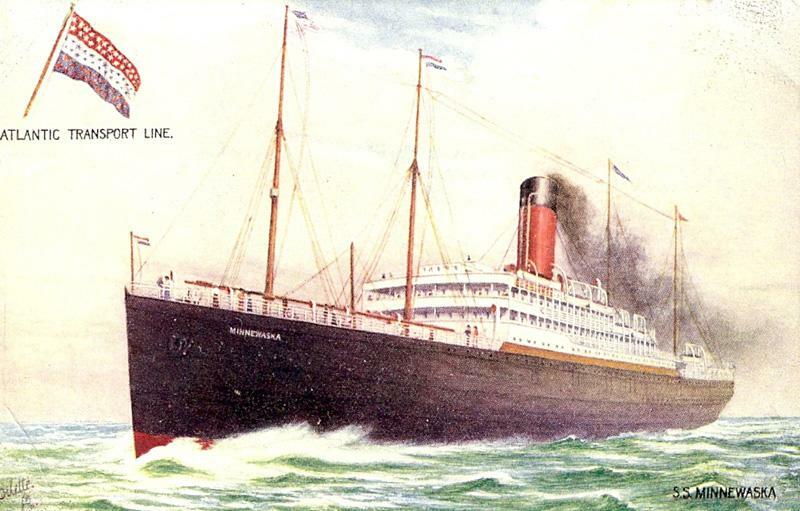 We had about 1900 men on board, and about 500 horses.........We still had no definite knowledge of our destination, but "the Dardanelles" was on everybody's lips. For the next few days we lay in harbour at Alexandria, and incidentally took on board a quantity of timber with which to construct a wharf. The censorship was in full swing, and very irksome to many...."